It's time for my October Class In The Mail! 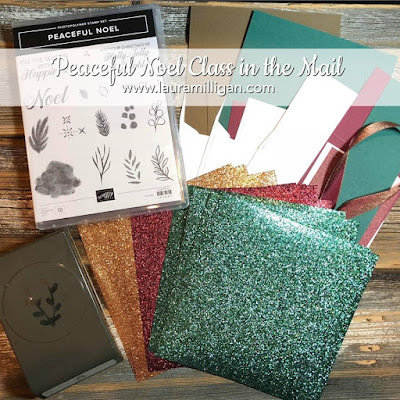 This month's projects feature the Peaceful Noel Bundle. Plus all supplies needed to create three different cards (envelopes included) and a Wine Bottle Tag - perfect for a holiday gift!!! and the step by step PDF tutorial for each project. I am so excited about this class - and I know you will love the projects! Cost for this class is $50 if local pickup. Add $7 for Prioirty Shipping if needed. If you are interested in this class, please send me an email at laura@lauramilligan.com and I will send you a paypal invoice. The class reservation period starts today and will end on October 25th. Class kits will be ready for pick up/or ship in early November.